We’ve all indulged in a little public display of affection at some point, and PDA’s are a common sight all around the world. Especially when on a romantic retreat and your destination is so overwhelming it warrants a kiss! And while there are destinations you should be wary of (ie United Arab Emirates), which frown upon public displays of affection, PDA’s are common in most cultures. But remember not to become too carried away in the moment. You are, after-all in public, so save your lust for your hotel room and keep it cute! Stick to soft kisses, lingering hands and gentle touches – you don’t need to reach for each other’s tonsils or engage in heavy petting! 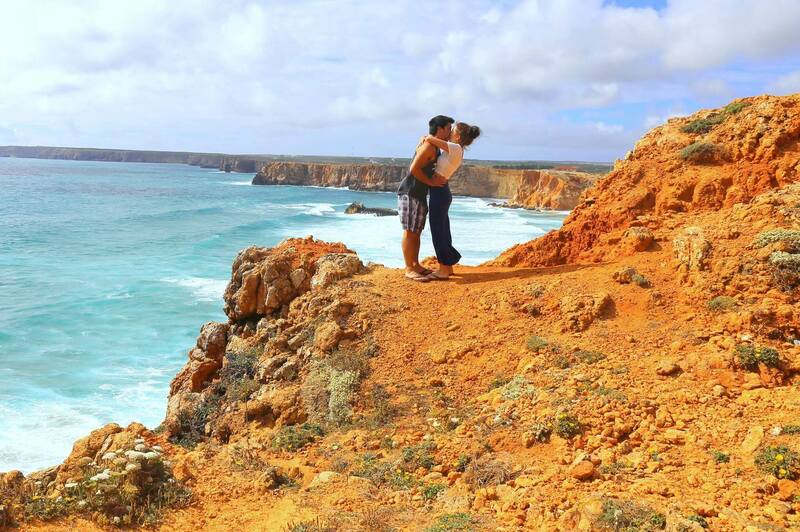 The following destinations lend themselves to amazing photo ops for public displays of affection, and it’s safe to say that these travelers make PDA’s look good!! Paris – city of love. 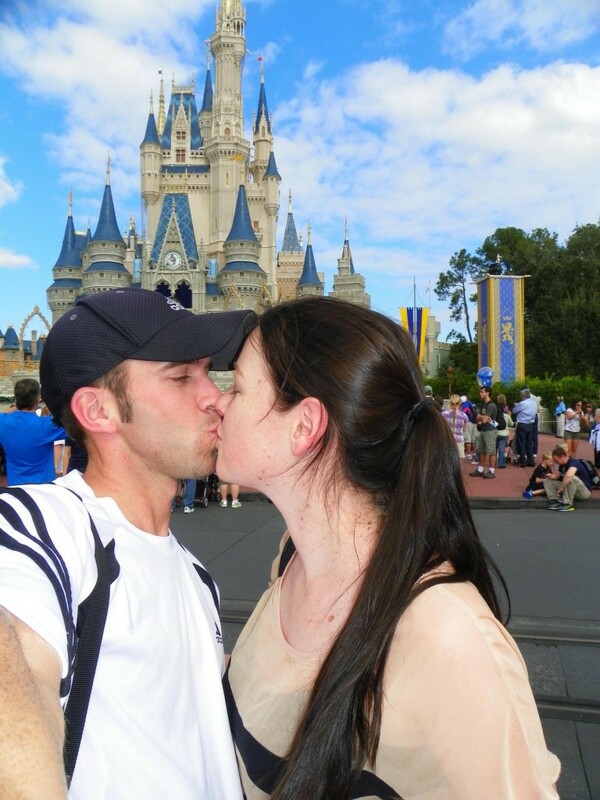 Disney – the happiest place on earth! Cartagena, Colombia is a romantic city, and seeing couple stealing a little smooch is common. Dani Blanchette of Going Nomadic. 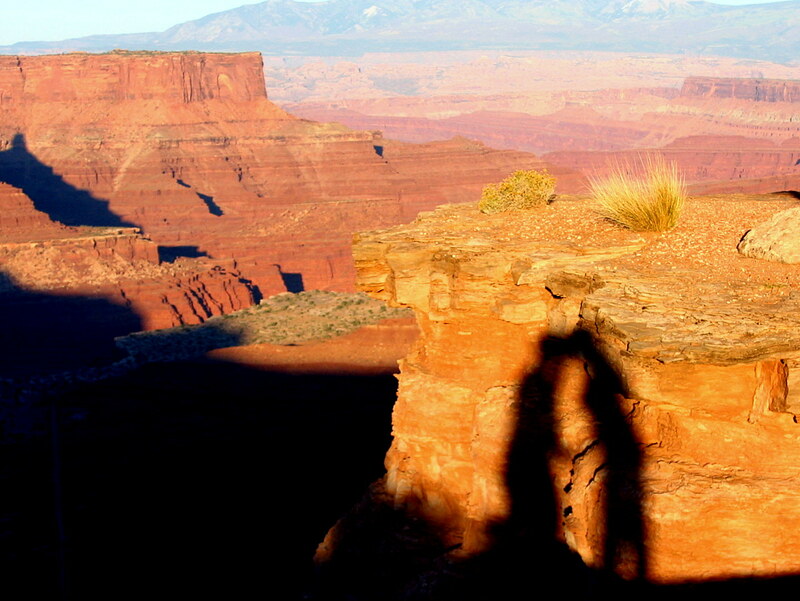 Silhouette of a kiss at Dead Horse Point State Park, Utah. Tamara and Donny of Turtles Travel. San Lois mountain at sunset in Galicia, Spain. Inma from A World To Travel. 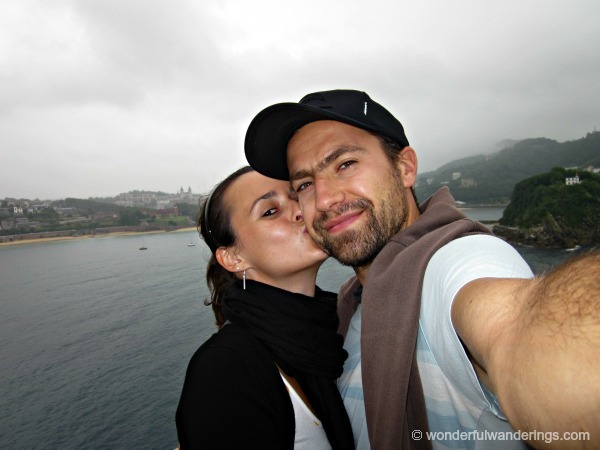 Kissing with San Sebastian in the background. Sofie Couwenbergh of Wonderful Wanderings. 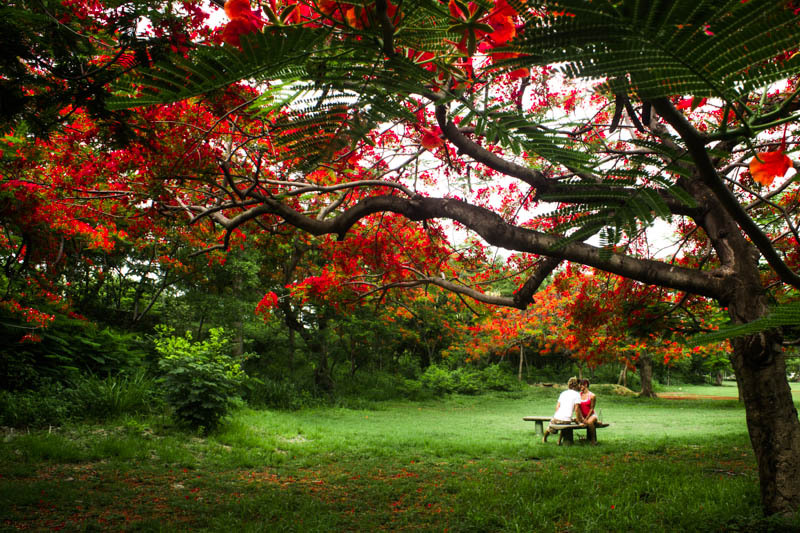 The flowering of the Flamboyant tree’s in the Dominican Republic creates an incredibly romantic atmosphere! Gabriel Harding of We Travel And Blog. 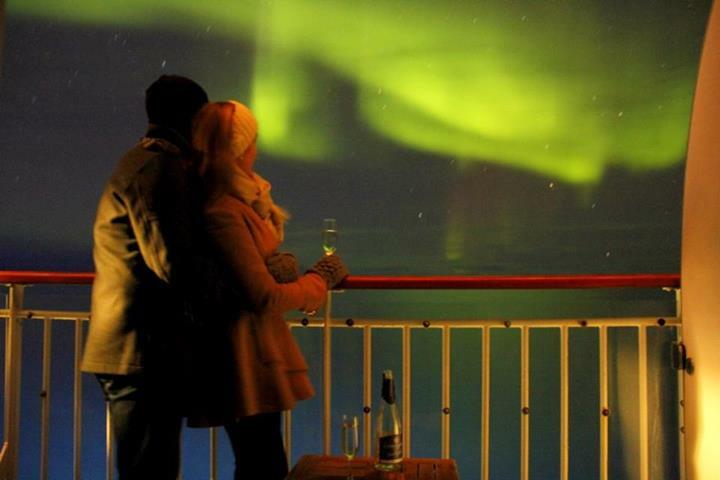 “I have kissed a West Coast girl underneath the Northern Lights” – Mike Howard of Honey Trek. 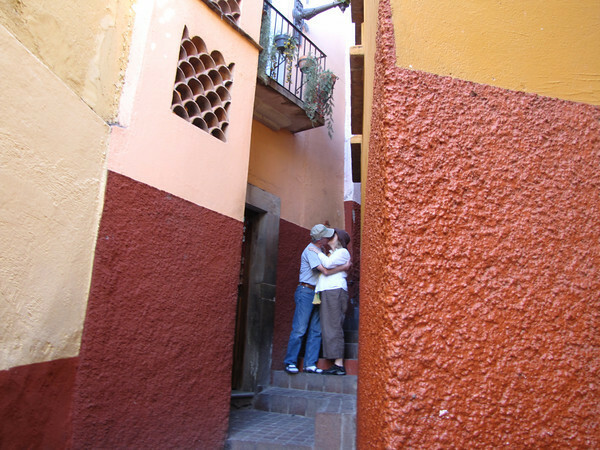 “Kiss alley” in Guanajuato, Mexico. Blogger Carole Terwilliger Meyers kissing husband Gene Meyers. Replicating the famous kiss of the Unconditional Surrender statue in San Diego, CA. – Helen Anne Travis of From Way Up High. Kimmy and Drew of AfterGlobe. After a visit to San Fransisco, it’s easy to see why so many leave their hearts there. Photo by Sara Sanger. Please read A Tribute To Kimmy Hayes. New York City – bright lights will inspire you! 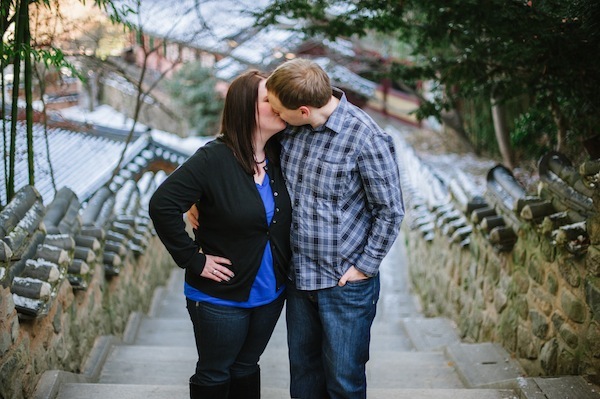 Korea is pretty anti-PDA, and since moving to Korea, I have felt really odd kissing my boyfriend in public, but it never felt as odd as when we were having a photo shoot at a Buddhist temple! I’m pretty sure kissing is considered a frowned upon behavior! Meagan LeAnne of Life Outside of Texas. Photo by Aaron Nicholas Photography. 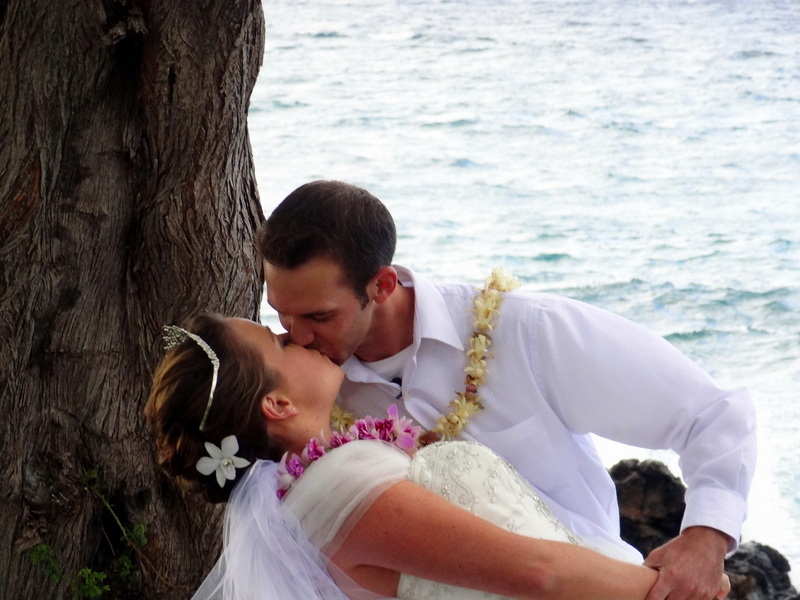 Hawaii – the ultimate romantic destination! Certainly no one will ever claim that a kiss on the Eifel tower, up in the Statue of Liberty, or right in the middle of Trafalger square is not romantic! Those sure are great spots. But there is nothing as romantic of a setting for a very public display of affection as when you see your wife on the other side of the Iimmigrations and customs doors when one of you are returning home from a long overseas trip. 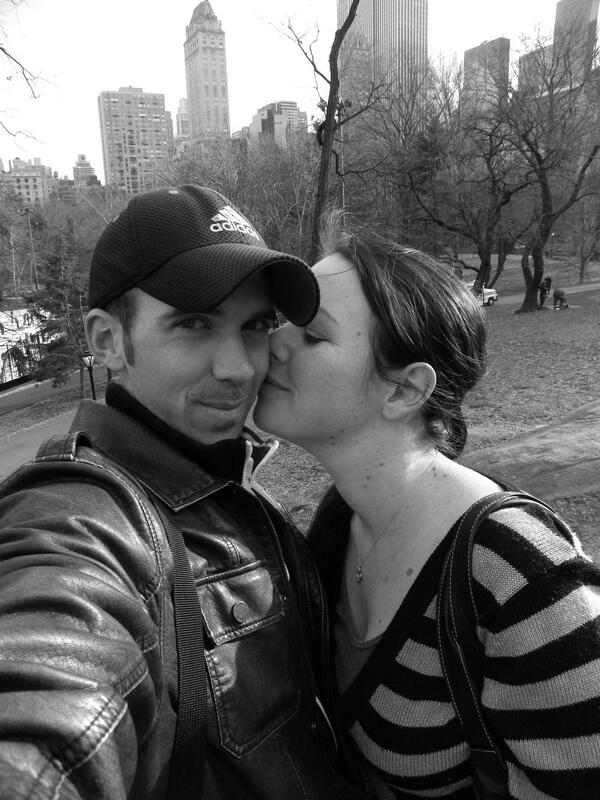 Some of the best public “smooches” I have ever seen ( or experienced) have been there! Nothing fancy for a location, but it sure is public and on-display for everyone. Very good point JR! I’ve certainly experienced that setting quite a lot while Mike and I were in a long distance relationship! Great post, Meg! One place I would LOVE to kiss is under the northern lights! 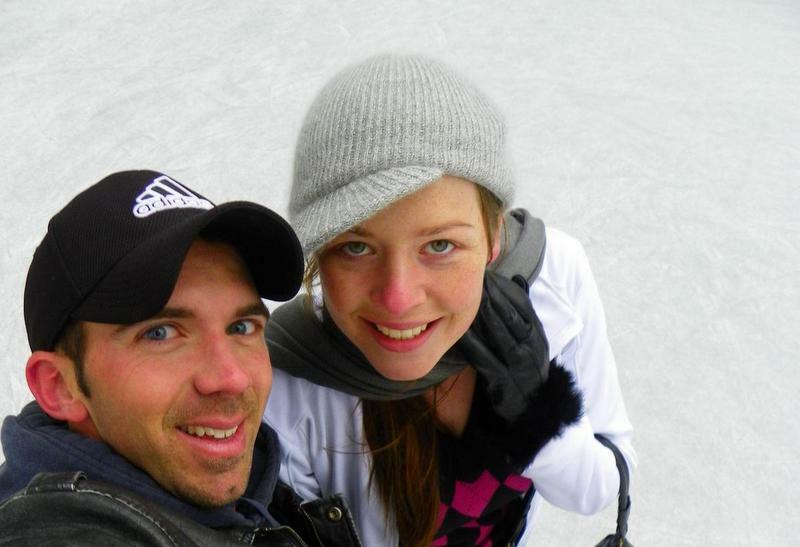 I can’t wait to get to the Arctic to recreate that photo either!! Kissing under the northern lights was such a thrill….definitely one of the highlights of the HoneyTrek :) – Really hope you make it up there…..wow! Best of luck! I’ll be following your blog and social media pages on the look out if you do happen to snap one! Aw, so many cute photos, it’s put a smile on my face :) Great post, well times for Valentine’s Day! Thanks Catherine! Glad we could bring a smile! Happy Valentines Day! Have a wonderful valentines day wherever you are in the world! The post came out great, Megan! 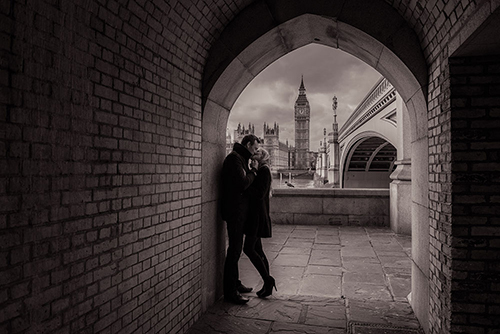 Beautiful shots of love in amazing locations. Like all, we’re super envious of the Northern Lights shot, but it’s great to have things to look forward to! Thanks for including our shot, and for brightening our day! It’s seriously sometimes so bad! That’s what you have a hotel room for people!! There’s definitely a fine line between cute and disgusting lol! 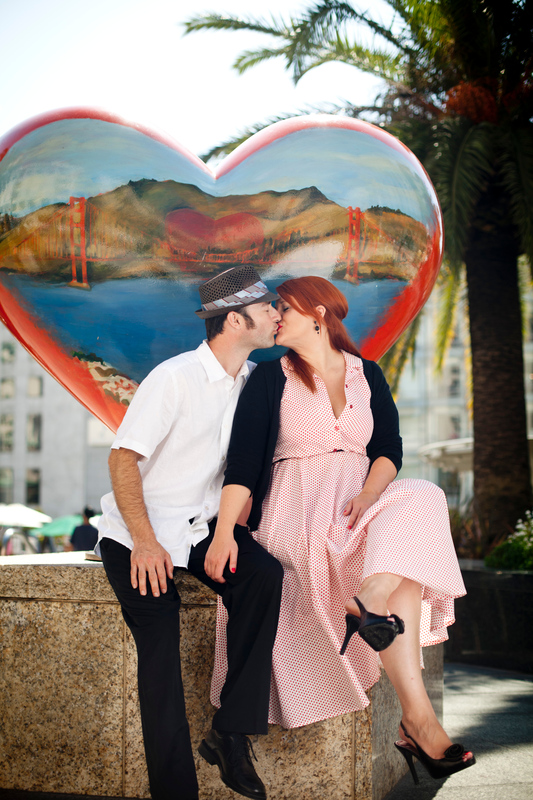 Ah, all that smooching:D Thanks for including us, Meg! Thanks for contributing! … sounds like a great excuse to go back to me! Wish you the best of luck! Will be following your blog in the hope for a Northern Lights pic!! Still be amazing even without the balcony or wine … lol although there’s your excuse to buy a nice bottle of wine one evening!! i have a good feeling you will see them Jessica….power of positive thought. with the help of a lot of coffee and this website http://www.gi.alaska.edu/AuroraForecast & http://www.swpc.noaa.gov/pmap/ – Good luck! What a sweet post! I loved it! Public display affection can like of generally comfortable with hand holding, quick kisses, and subtle hands on thighs, waist, legs and kisses. Public Display Of Affection – Some might feel it embarrassing while others might find it liberating, however recent research says that those who have open relationships on Fb are more satisfied than those who don’t.